Vine Trust is very happy to share that you can now purchase a Vine Trust branded neck buff. 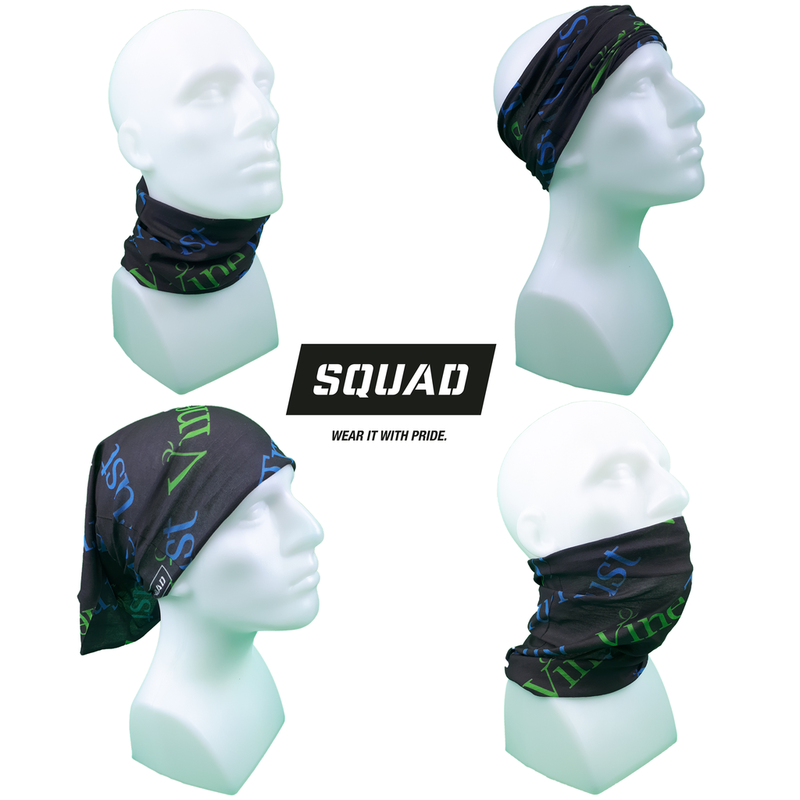 Looking for a stylish, comfortable head and neck buff to protect you from the sun? 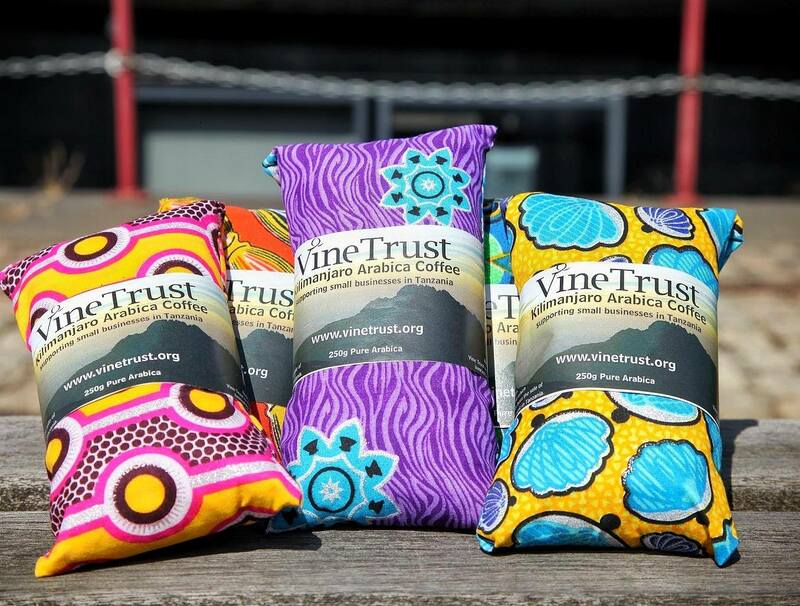 Whether you are on a work site in Moshi constructing homes with our partners, on the Forth Hope on the Peruvian Amazon or in your back garden, a Vine Trust styled buff is a great way to keep cool. Buy it direct from SquadScarf for £15 and £5 of the price of your buff will go towards Vine Trust and our programmes. 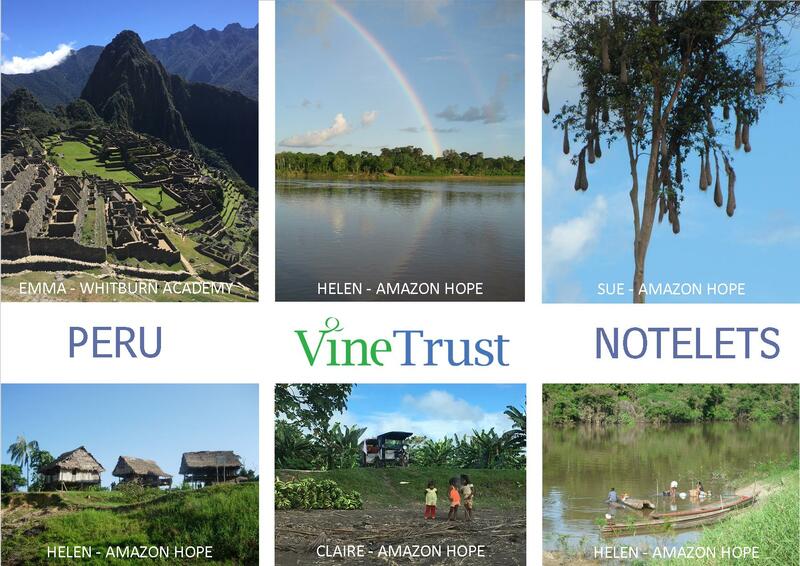 These notelets support the ongoing charitable work and development of Vine Trust. Each card is blank inside for your own message and features a photo taken by a Vine Trust volunteer whilst in-country on a Vine Trust expedition. These packs of notelets make a fantastic and unique gift or card for your own use! Grown in the volcanic region of Mount Kilimanjaro. The beans are prepared, roasted, ground and packaged by a local widow in Moshi called Mama Rose. Each 250g bag is beautifully packaged in traditional African fabric and labelled with our own Vine Trust label. The average midwife in remote Amazonian communities is expected to treat patients over a 1,800 km area. This means that many communities are left with little or no access to vital healthcare for both mother and child. 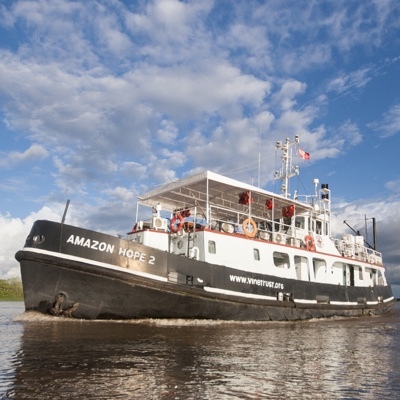 This gift will enable our medical vessels, with trained midwives on board, to continue providing a whole range of mother and child services, bringing hope to communities on the Amazon. In the Loreto region of Peru, isolated Amazonian communities live with little or no access to vital healthcare. Vine Trust’s medical vessels have innovated the delivery of regular primary health care, bringing hope to these communities. 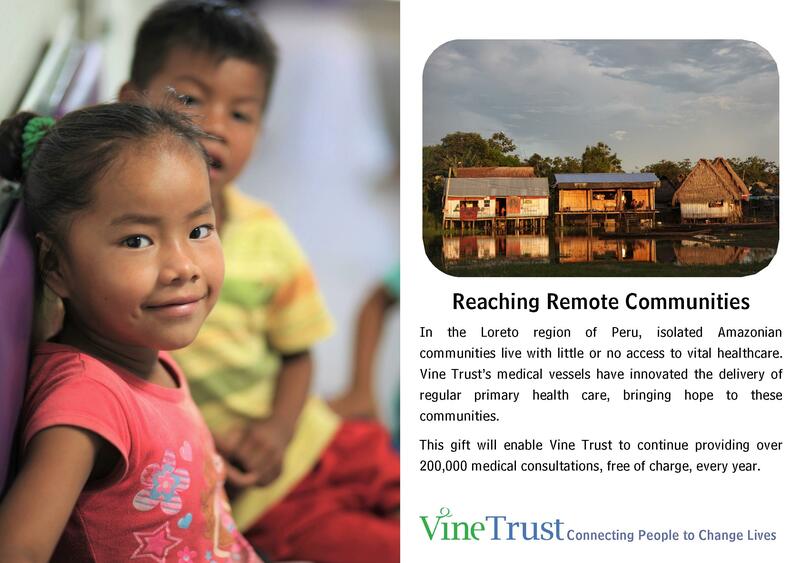 This gift will enable Vine Trust to continue providing over 200,000 medical consultations, free of charge, every year. 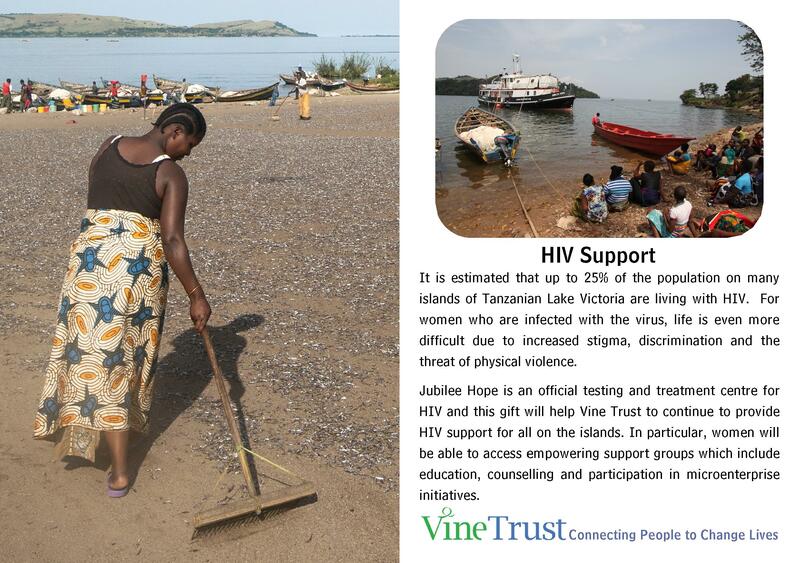 It is estimated that up to 25% of the population on many islands of Tanzanian Lake Victoria are living with HIV. For women who are infected with the virus, life is even more difficult due to increased stigma, discrimination and the threat of physical violence. Jubilee Hope is an official testing and treatment centre for HIV and this gift will help Vine Trust to continue to provide HIV support for all on the islands. In particular, women will be able to access empowering support groups which include education, counselling and participation in microenterprise initiatives. 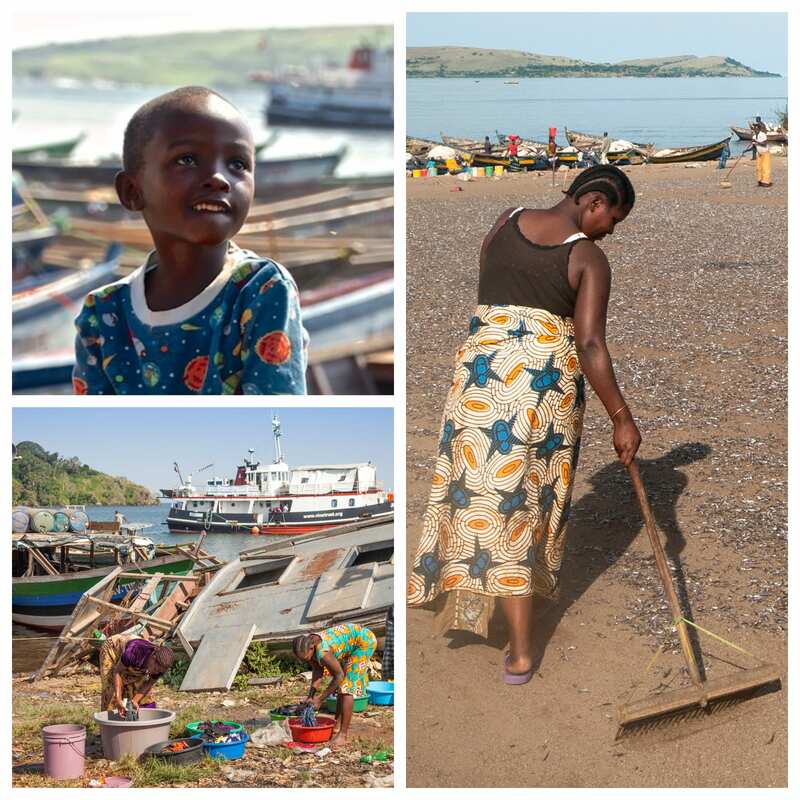 The leading cause of death reported for infants and children on the islands of Lake Victoria is malaria. This life-threatening disease often goes untreated due to the few health facilities on the islands running out of medication. 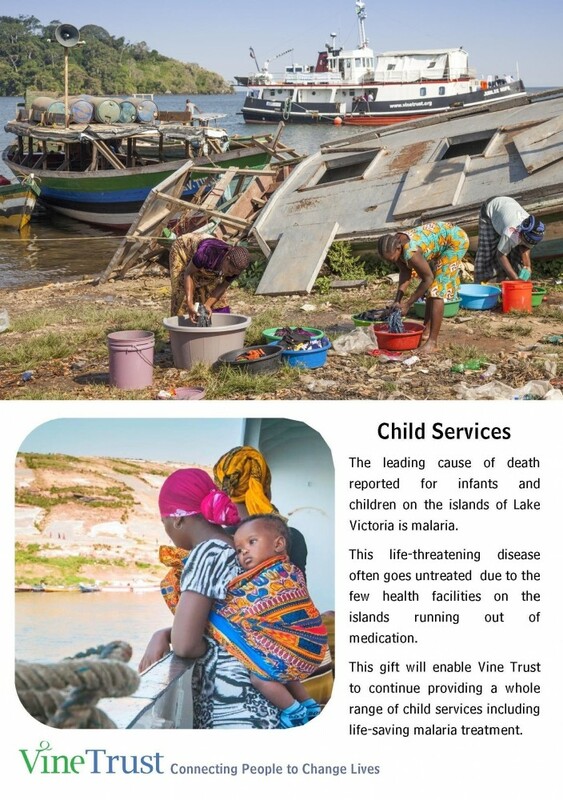 This gift will enable Vine Trust to continue providing a whole range of child services including life-saving malaria treatment. Vulnerable communities on the islands of Lake Victoria face even greater challenges than a poor harvest or unsuccessful fishing trip. When someone falls ill their limited income will rarely stretch to pay for medicine – if medicine can be found on the islands in the first place. That’s why the Jubilee Hope Medical Programme provides all of its medicines free of charge. This gift will help Vine Trust to continue providing free services to all of its patients in Tanzania – that’s around 55,000 a year! Journeys to the nearest dental posts in remote areas of the Peruvian Amazon can often take many days. 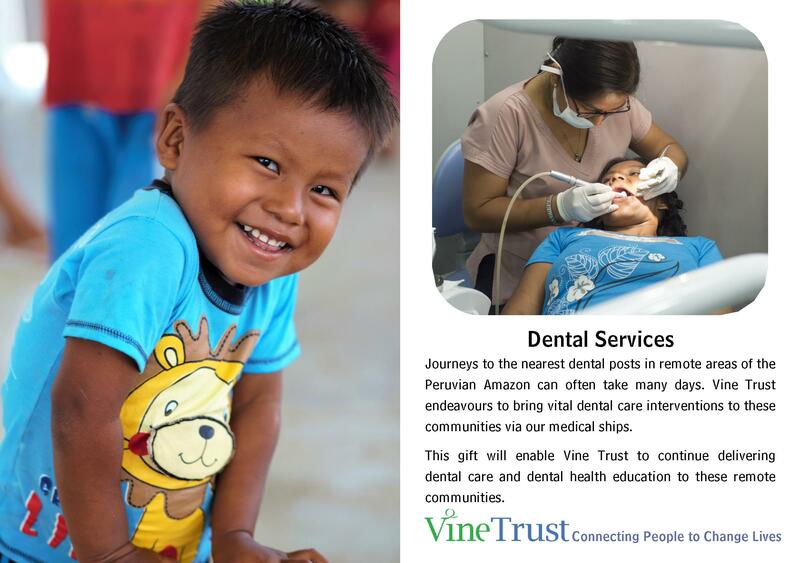 Vine Trust endeavours to bring vital dental care interventions to these communities via our medical ships. This gift will enable Vine Trust to continue delivering dental care and dental health education to these remote communities. 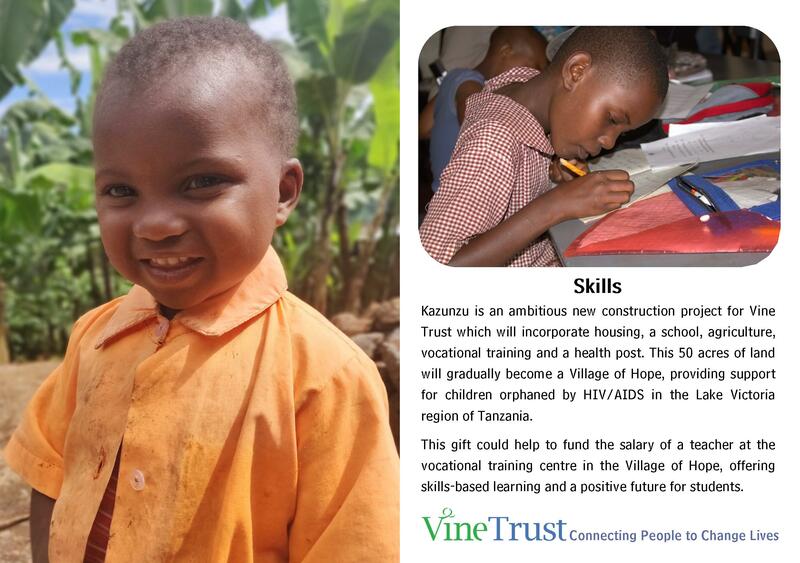 Kazunzu is an ambitious new construction project for Vine Trust which will incorporate housing, a school, agriculture, vocational training and a health post. This 50 acres of land will gradually become a Village of Hope, providing support for children orphaned by HIV/AIDS in the Lake Victoria region of Tanzania. This gift could help towards the cost of school shoes and uniforms allowing resident children of the Village of Hope to take pride in their education. Kazunzu is an ambitious new construction project for Vine Trust which will incorporate housing, a school, agriculture, vocational training and a health post. This 50 acres of land will gradually become a Village of Hope, providing support for children orphaned by HIV/AIDS in the Lake Victoria region of Tanzania. This gift could help to fund the salary of a teacher at the vocational training centre in the Village of Hope, offering skills-based learning and a positive future for students. 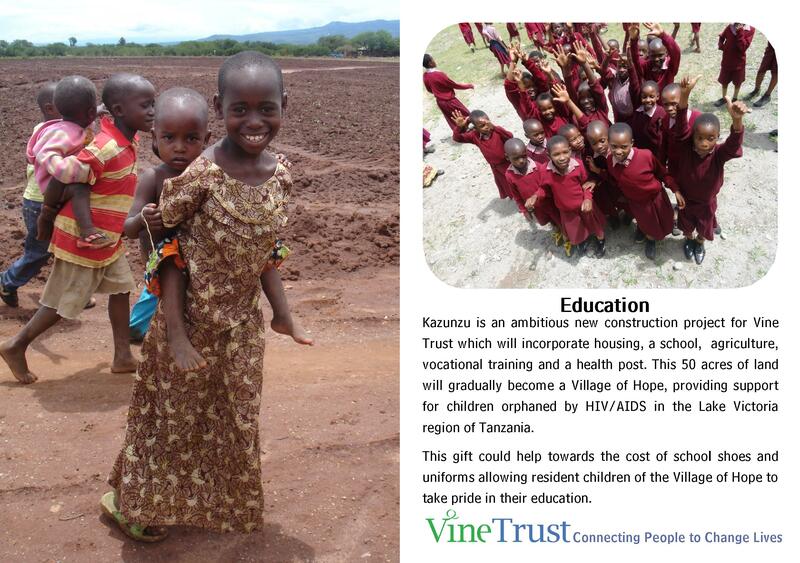 Kazunzu is an ambitious new construction project for Vine Trust which will incorporate housing, a school, agriculture, vocational training and a health post. This 50 acres of land will gradually become a Village of Hope, providing support for children orphaned by HIV/AIDS in the Lake Victoria region of Tanzania. This gift could fund a shamba starter pack of seeds and essential agricultural tools for the residents of the Village of Hope, the first steps towards a sustainable future. Set of 9 Kazunzu - Village of Hope Gift Aid Cards for the Cyber Monday promotional price of £50.00 (3 different designs, 9 blank envelopes). Each card has a colourful picture on the front, a description of how the purchase of the card could support the Programme, and a blank insert for your own message. 3 Designs; Sustainable Agriculture, Education, Skills. Set of 9 Gift Aid Cards for the Cyber Monday promotional price of £50.00 (9 different designs, 9 blank envelopes). Each card has a colourful picture on the front, a description of how the purchase of the card could support our Programmes, and a blank insert for your own message. 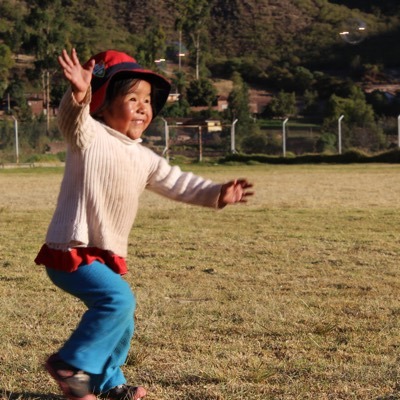 3 x Amazon Hope Programme; Mother and Child Services, Dental Services, Reaching Remote Communities 3 x Jubilee Hope Programme; Medicines, Child Services, HIV Support 3 x Kazunzu - Village of Hope; Sustainable Agriculture, Education, Skills. Set of 9 Amazon Hope Medical Programme Gift Aid Cards for the Cyber Monday promotional price of £50.00 (3 different designs, 9 blank envelopes). Each card has a colourful picture on the front, a description of how the purchase of the card could support the Programme, and a blank insert for your own message. Designs; Mother and Child Services, Dental Services, Reaching Remote Communities. Set of 9 Jubilee Hope Medical Programme Gift Aid Cards for the Cyber Monday promotional price of £50.00 (3 different designs, 9 blank envelopes). Each card has a colourful picture on the front, a description of how the purchase of the card could support the Programme, and a blank insert for your own message. Designs; Medicines, Child Services, HIV Support. A unique 14 month calendar featuring competition winning photos and quotes by Vine Trust volunteers. 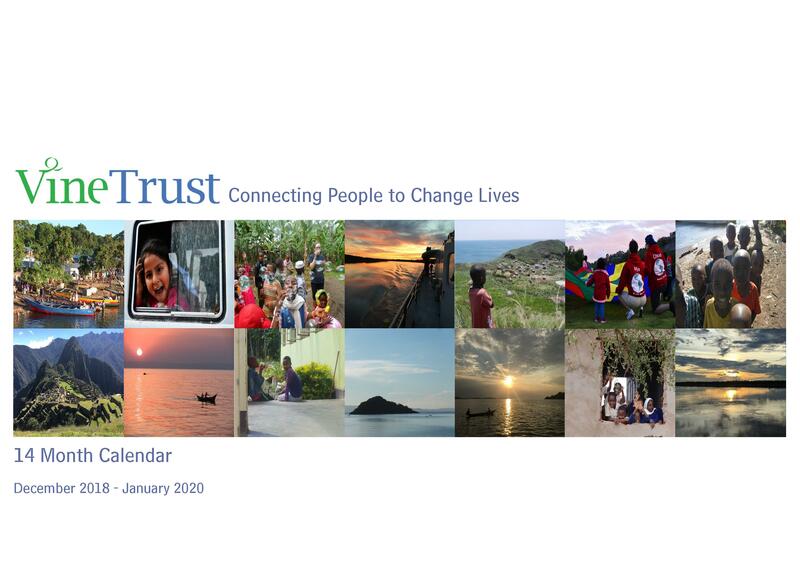 This purchase of this 2019 Vine Trust calendar supports the ongoing charitable activities and work of the Trust. Created from winning photographs and quotes by our Vine Trust volunteers, this calendar 'gives back' the whole year round! Kazunzu Village of Hope will be a centre of excellence in providing a future, education and training, constructed on a piece of land to the West of Mwanza, on the shore of Lake Victoria in Tanzania. The village will consist of clusters of individual homes, a vocational training centre will provide hands-on learning opportunities for those in the village and the broader community. Schooling will be provided in later phases for the children living at Kazunzu and the surrounding farms and villages. Sustainability will be key to the success of such a programme and we hope to create an array of income opportunities for the villagers. Vine Trust 300 is a group of 300 supporters committed to raising at least £1,000 each year for 3 years to support Vine Trust's life-changing work. 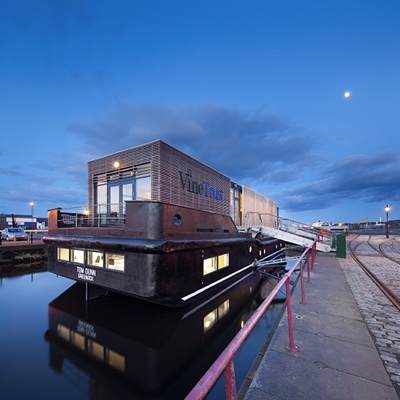 Vine Trust 300 is open to any individual, company or group, and funds raised will go towards supporting all aspects of Vine Trust's work, including our Medical and Home-building programmes. 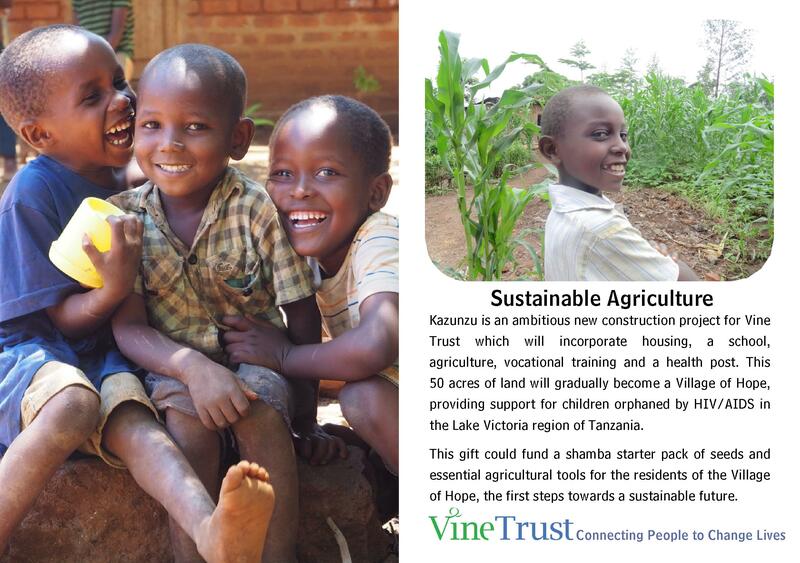 For more information about the Vine Trust 300 programme, visit our Vine Trust 300 page. Vine Trust's Tanzania Home-Building Programme works with local partners to build safe and secure accommodation for children and families. Empowering local communities to enact sustainable change, our individual family home and larger children's homes provide safety and security for vulnerable people, offering the opportunity to pursue a brighter and more hopeful future. 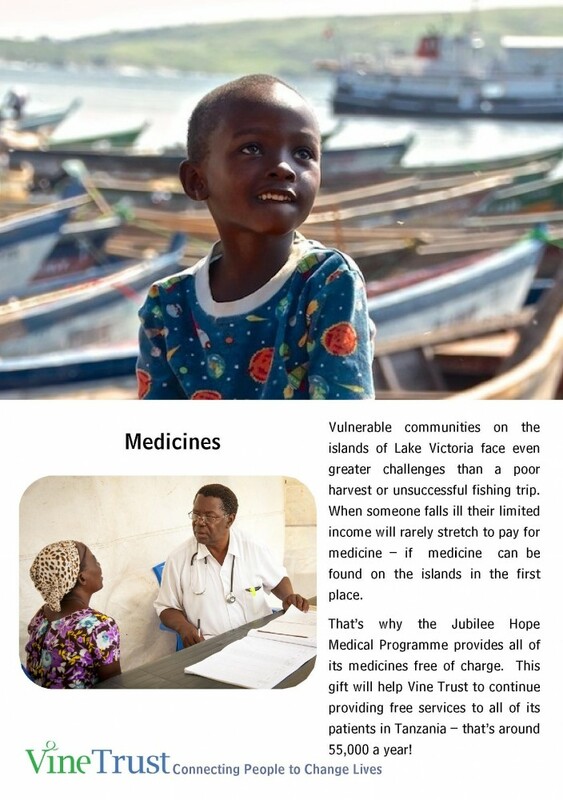 Vine Trust's Jubilee Hope Medical Programme provides life-changing medical treatment to poverty-stricken communities living on the islands and shore of Lake Victoria, Tanzania. In the Kagera region, where Jubilee Hope operates, there are only 25 doctors to treat a population of 2.5 million, many of whom are struggling with the debilitating effects of the HIV virus. Jubilee Hope offers a vital lifeline to these communities, providing consultations, treatment and education to help support a brighter future for these people. 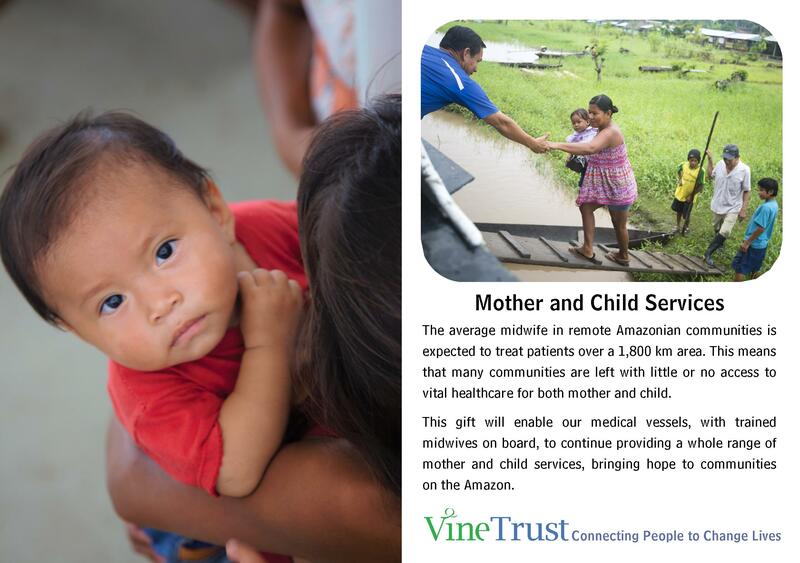 Vine Trust's Amazon Hope Medical Programme brings vital primary healthcare services to remote communities living along the Amazon River in Peru. Working in partnership our team of local clinicians, this project has already provided over 1.2 million medical and dental consultations. 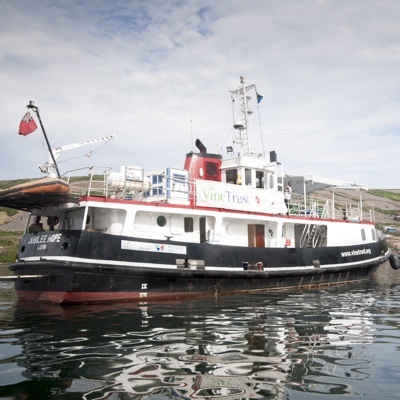 Amazon Hope 2 and our new ship, Forth Hope, will be able to provide 200,000 consultations annually in over 160 vulnerable communities. 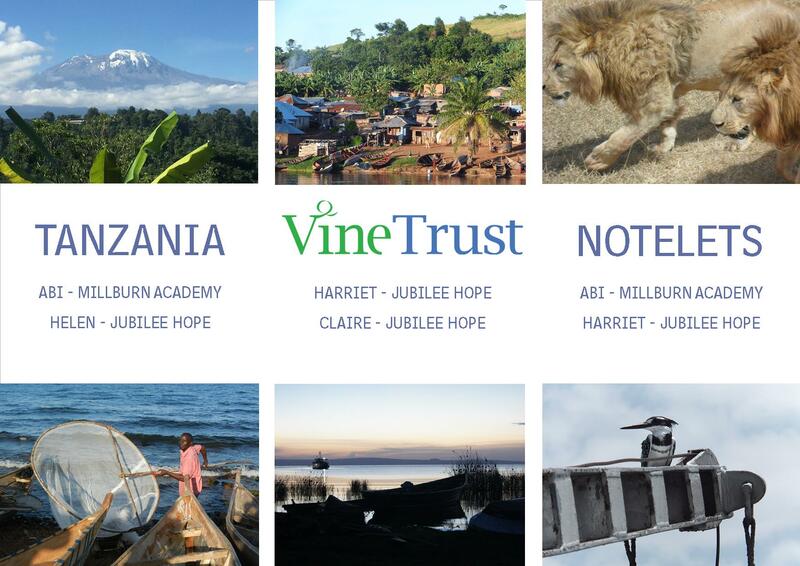 Support the development of Vine Trust's life-changing work in Tanzania and Peru. 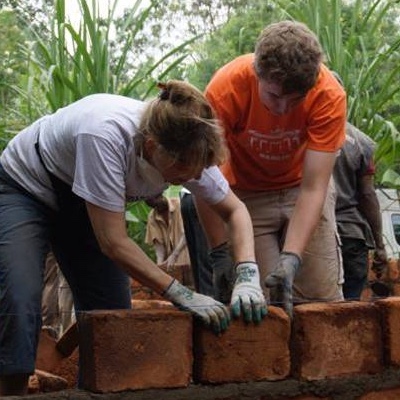 Through the efforts of our Medical, Home-Building and School Expedition teams volunteering on our sustainable development programmes, we are helping to enact real, effective and lasting change to support a more hopeful future for some of the world's most vulnerable communities. Help us to empower communities through the change they want and need. The personal information you give with your donation will be used by Vine Trust to record your donation and fulfil our financial statutory responsibilities (and held for 7 years). No information will be shared with any 3rd party. If you think there is a problem with the way Vine Trust are handling your information, you have the right to complain to the Information Commissioner’s Office.